Planning a lesson about direct and inverse variation, I thought I'd share the hook I use to introduce the concept. This is the script I use in class, but it was heavily cribbed from articlesforeducators.com. If 5 cats can catch 5 mice in 5 days, how many days does it take 3 cats to catch 3 mice? The "obvious" answer is three. Three cats catch three mice in three days. However, this answer is not correct! 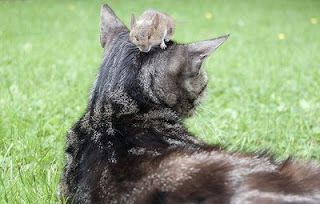 As the number of cats increases the number of mice they can catch increases. "Direct variation" means that as one quantity increases, the other quantity will also increase. On the other hand, as the number of cats increases, the number of hours required to catch a certain number of mice decreases. "Inverse variation" means that as one quantity increases, the other quantity decreases. And finally, since 1 cat catches 1 mouse in 5 days, if you have three times as cats, they'll catch three times as many mice in the same amount of time. So 3 cats catch ____ mice in 5 days. Ohhh, I like this! I was so rushed during this part of the curriculum that I only got to spend 1 1/2 days on direct and inverse variation. But it's one of those places where I bet you can take a really nice, "reality based", mathematical excursions. I'm totally going to use your cat problem as a bonus problem for my students.